In early 2018, the Chinese startup TuSimple will formally open a research and testing facility here in Arizona, testing and developing its autonomous trucks. The company already completed a successful test run in July 2017, with a 170-mile public road trial of an autonomous truck from San Diego, CA to Yuma, Arizona. They kick off more testing and research in early 2018 to continue perfecting their systems. TuSimple throws its hat into the ring with other competitors like Uber, Tesla, and Waymo. All of these companies are looking to transform the trucking landscape—how to deliver commercial goods, increase productivity, decrease truck accidents, and improve safety on the roads. Unlike its competitors, TuSimple has no plans to branch out into the passenger car market. Instead, the company will focus all their efforts on their Level 4 trucks, leading to a launch of a commercial autonomous trucking service in 2019. Just what are Level 4 autonomous trucks? Level 4 is what most articles and news reports are talking about when they mention “autonomous vehicles.” It means that the vehicle is highly autonomous and can perform all driving functions and monitor the roadway and conditions on its own for the duration of the trip. However, Level 4 vehicles may still require human intervention from time to time, so they typically have steering wheels and pedals. Level 0: No automation. This is probably the car or truck you’re driving today. Even with cruise control, your car has no level of autonomy, because you still have to adjust the speed or turn it on and off. Level 1: Driver assistance required. Adaptive cruise control, however, does fall under Level 1. So does lane-keeping assistance. Both of these features adjust your speed and adapt for you. However, you still need to maintain awareness and control. Level 2: Partial automation options. Some vehicles have an autopilot mode that will control your speed and steering in certain environments, like highway driving. However, you must still pay full attention to driving conditions and be ready to take over immediately. They are not full self-driving cars. Level 3: Conditional automation. When engaged, the car’s system will take over monitoring conditions as well as driving. Audi’s new system has a traffic jam feature that takes over the job of crawling through traffic. The system will alert the driver when it needs intervention. Level 4: High automation. Automated vehicles can handle most driving tasks on its own. They need driver intervention during bad conditions or unusual environments or circumstances. Level 5: Full automation. These vehicles are completely automated and require zero human intervention. The cars can go anywhere, at any time, all on its own. One of the biggest draws of autonomous vehicles, especially big rigs, is safety. Proponents believe the use of autonomous trucks can help reduce trucking accidents. 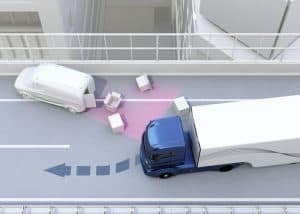 With 94% of all serious vehicle crashes due to human error, it seems the more we can automate certain driving tasks, the more we can reduce chances of being injured in a truck accident. Commercial trucks kill and injure tens of thousands of Americans every year. It will be great if self-driving trucks are safer. But will they be? Only time will tell. At Plattner Verderame, P.C., we seek justice for those who have been hurt by others’ negligence. If you sustained injuries in a collision with a commercial truck, or have questions about your legal rights after an accident, we want to help. Please call 602-783-8793, or fill out our contact form, and schedule your free initial consultation at our Phoenix office today.